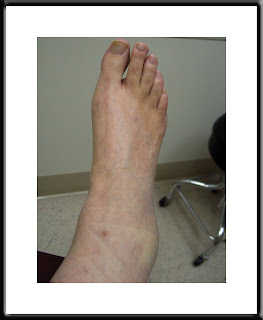 I took a goofy fall today and broke my outside ankle bone. I stepped off a curb funny and slammed to the ground without any notice. Irritating and embarrassing. My daughter helped me to the intermediate care facility and to amuse ourselves while waiting for the doc (when I wasn't groaning with pain), we posed my injury for the camera I always carry in my purse. JEEEEEESUS! Linda! OMG! Are you going to have to have surgery? Ouch! Nope, no surgery. Actually, despite its initial odd appearance, it's a fairly benign break. Just a chip off the old fibula, so-to-speak. Now I'm in an air cast and can walk with the aid of one crutch instead of two. It'll be four more weeks with the cast and we'll see what happens after that.